NASA astronaut Donald Pettit, the first one into the docked capsule, said it reminded him of the cargo capability of his pickup truck back home in Houston. "The smell inside smells like a brand new car," Pettit reported. The compartment was brilliantly white and, he noted; clean, no dirt or other particles appeared to be floating around. To protect against possible debris, Pettit wore goggles, a mask and a caver's light as he slid open the hatch of the newest addition to the International Space Station. The complex sailed 250 miles above the Tasman Sea, just west of New Zealand, as he and his crewmates made their grand entrance. "This event isn't just a simple door opening between two spacecraft - it opens the door to a future in which U.S. industry can and will deliver huge benefits for U.S. space exploration," the Space Frontier Foundation, an advocacy group, said in a statement. The California-based SpaceX - formally Space Exploration Technologies Corp. - is the first private company to send a vessel to the space station. It's run by Elon Musk, a billionaire who helped create PayPal and founded the electric car company Tesla Motors. NASA is handing over orbital delivery work to American business in order to focus on bigger and better objectives, such as getting astronauts to asteroids and Mars. The space agency hopes astronaut ferry trips will follow soon; SpaceX contends its Dragons could be carrying space station astronauts up and down within three or four years. "It's great to see you guys inside Dragon. It looks great," Mission Control radioed. The six space station residents have until the middle of next week to unload Dragon's groceries and refill the capsule with science experiments and equipment for return to Earth. Unlike all the other cargo ships that fly to the orbiting lab, the Dragon is designed for safe re-entry. It will be freed on Thursday and aim for a Pacific splashdown. 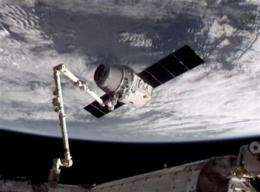 The Dragon - 19 feet tall and 12 feet wide - was launched Tuesday from Cape Canaveral aboard a SpaceX Falcon 9 rocket. Pettit used the space station's robot arm to snare the unmanned capsule on Friday. It carried up 1,000 pounds of food, clothes, batteries and other provisions. It will bring back 1,400 pounds' worth of gear.